A few years ago, when I heard that Bradley Cooper and Irina Shayk have a holiday on the Amalfi coast I was not only super jealous but green with envy. I’ve always wanted to go to Amalfi coast and preferably with Bradley. He, however, decided to first cruise along the coast with Irina and then start a family with her. C’est la vie. Finally, it was my turn. Not the family thing, but going to Amalfi coast. And while B. was changing diapers, I sailed along the coast and enjoyed the dolce vita. 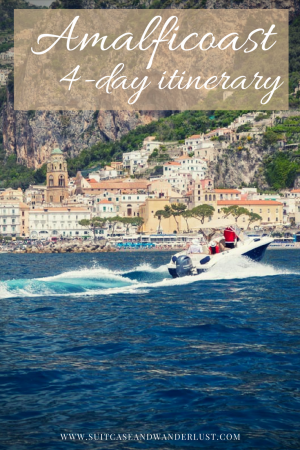 Here’s my Amalfi coast 4 day itinerary and some top tips for you. 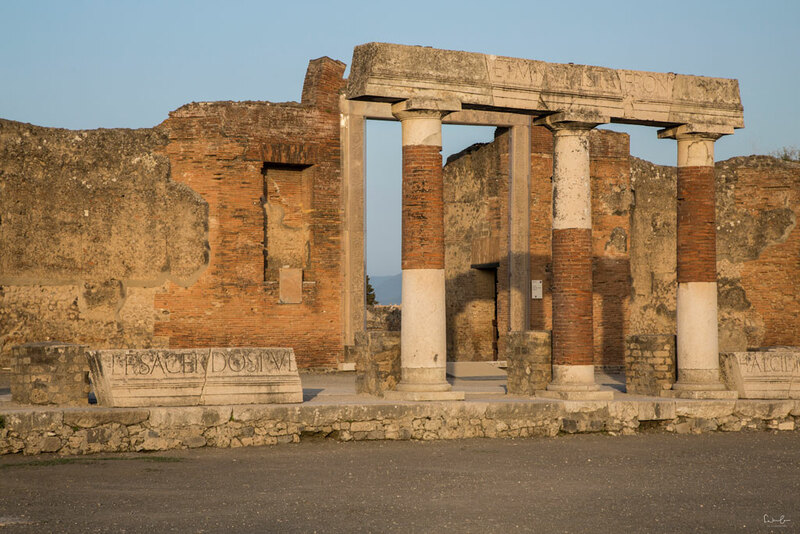 Before you head to the coast I strongly recommend to visit the ruins of Pompei. I arrived there in the afternoon and discovered this ancient place in the golden hours before the sunset. It was a perfect time because it wasn’t too crowded and the light was just beautiful. The ruins are very impressive and you can easily spend a whole day strolling this huge sight. You can do Pompei on a day trip from the Amalfi coast or follow my itinerary and spend a night in Hotel Palma with its wonderful rooftop terrace* from where you have a fantastic view on Mount Vesuvius. My tip: Order pizza and white wine and enjoy the view from the terrace of the hotel. It’s a perfect start to the short trip. 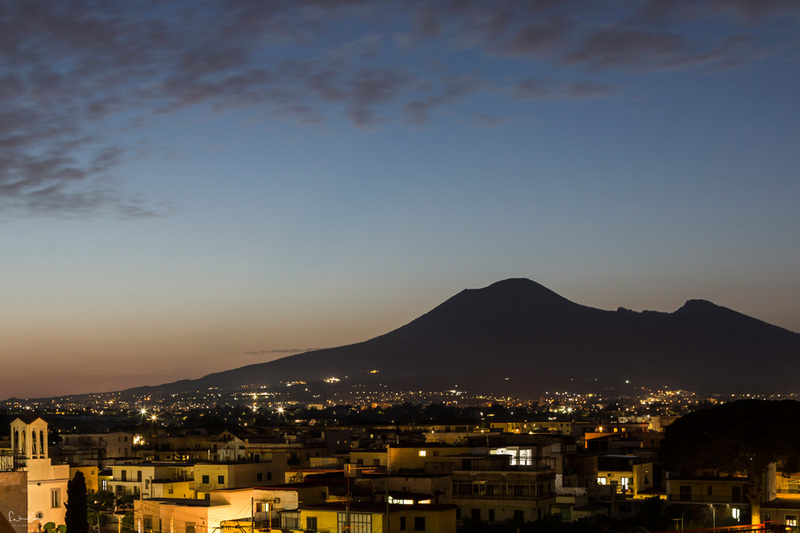 After breakfast hop in the car and make your way towards Mount Vesuvius for a hike. If you start walking from the parking area, the hike takes more than one hour but you have to walk along the road. I’d rather suggest you take a shuttle and then walk the last trail. Bring good shoes and water with you as the trail is quite steep and the sun might be burning down. I recommend you to do this activity in the morning. Not only because of the heat but also the crowds of people hiking up the narrow paths towards the crater. From the top, you’ve got an impressive view which you don’t want to miss. A little drop of bitterness, however, is the garbage everywhere. I honestly don’t understand why people just throw away their water bottles. And I do not understand why the local national park operators seem to not do anything against it. Why not investing a part of the admission fee of 10 Euro per person in waste disposal? 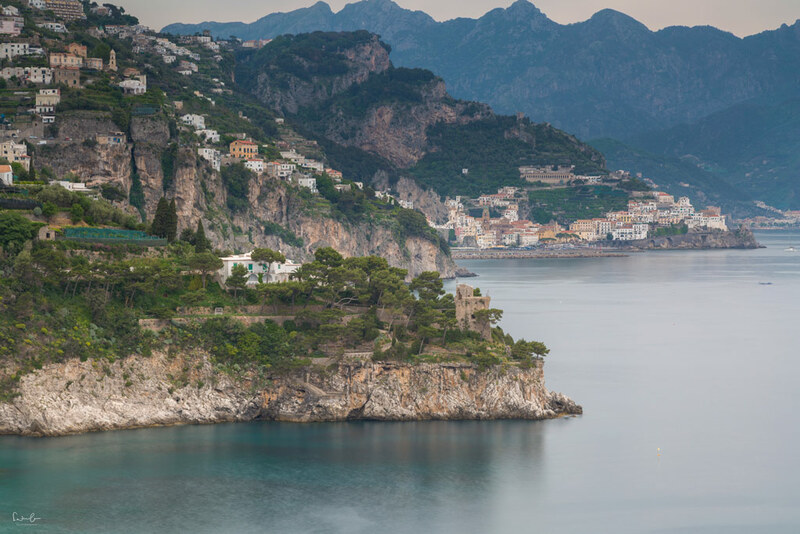 After your morning hike activity, head towards the Amalfi coast. Enjoy an aperitivo at the beach of Conca dei Marini and order a delicious seafood pasta in one of the three restaurants on this little beach. I started the first day at the sea with a sunrise shooting. I am not very good at getting up on mornings, in fact, I’m really struggling. The great thing there was that I could photograph the sunrise from the balcony of my hotel room. What a treat! 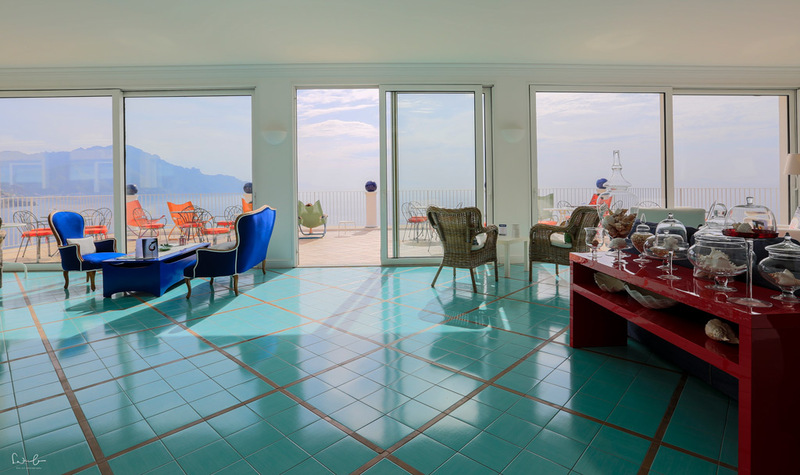 After the shooting and a wonderful sea view breakfast make your way to Ravello, a village high above Amalfi with a breathtaking view of the coast. 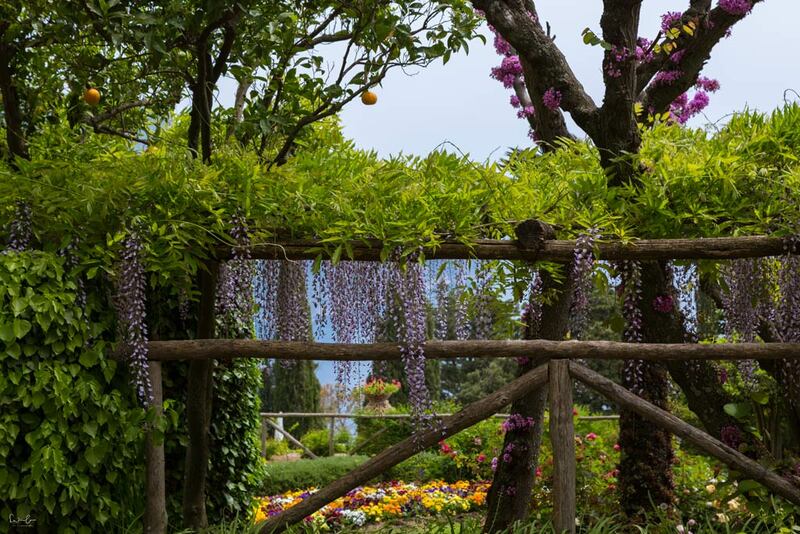 Stroll through the village and find your way to Villa Cimbrone, a huge estate with beautiful gardens. The infinity terrace with its infinite view is simply stunning and the wisteria arch was one of my personal highlights. I even managed to capture it without people. Have a seat in the quiet Teagarden and enjoy the moment. 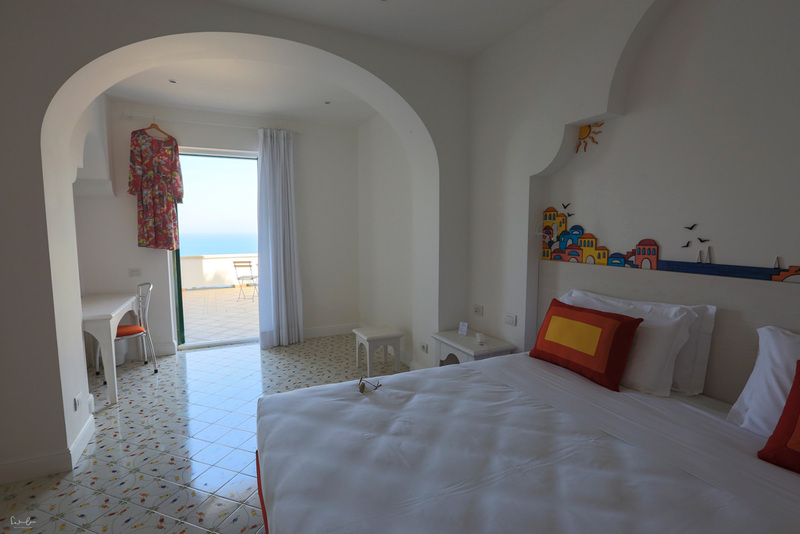 The villa also houses a hotel offering different areas for hotel guests only. 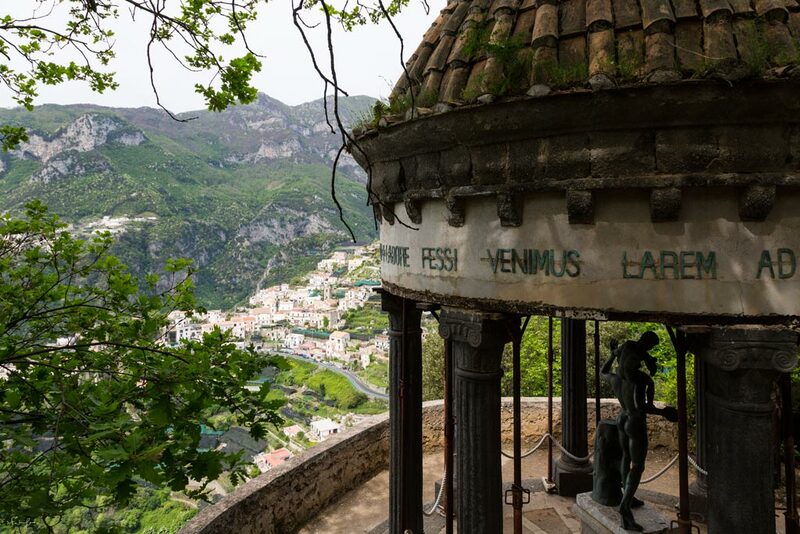 My personal tip: All the tour operators guide the tourists through the village of Amalfi in the morning and then head to Ravello in the afternoon. Be there in the morning to avoid the crowds. I left Ravello to head back to Conca dei Marini for lunch. The Linguini with Scampi in the beach restaurant was just perfect. Afternoon siesta at the beach? Check. Either you stay at the little beach next to the restaurant or you rent a kayak and paddle to the next bay. 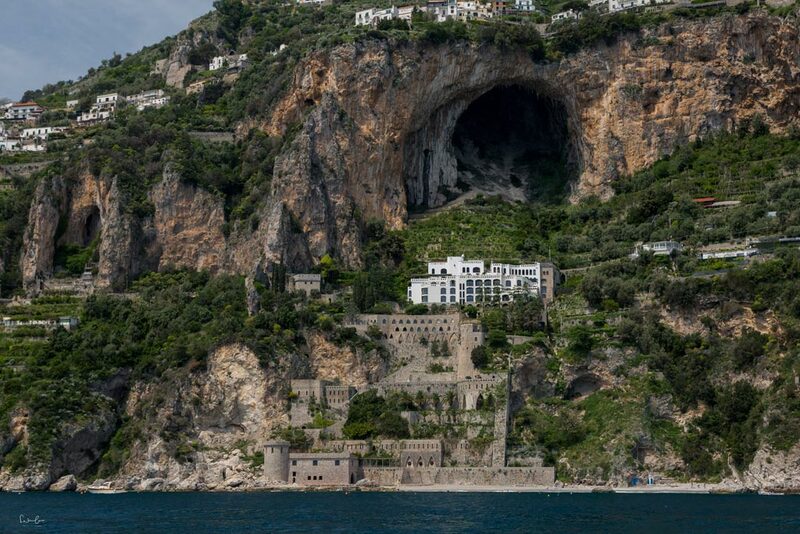 I found one very near, just around the corner towards Amalfi, which was only accessible by water and therefore empty. It was a perfect afternoon with some fun on the kayak and a nap on the empty beach. After a relaxing afternoon, I decided to visit Positano for a stroll and to take some photos. I was pretty laid back but the car drive along the narrow coastal road resulted in a real ordeal. It seems everyone owning a car is on the road and there’s just not enough space for so many. It took me ages to get there and apart from that, there was no chance to stop taking some shots as there were cars parking far outside Positano. After quite a while I was lucky enough to find parking to finally start exploring the village. I walked hundreds of stairs down to where the hot spot was to discover that this place was not the right one for me. It was jam-packed and touristy, the restaurants are crowded and expensive. It looks amazingly beautiful from the water with its steepness and all the houses built into the rocks. But apart from that and the view from the top downwards I couldn’t find any highlight that kept me hanging out there for a couple of hours. 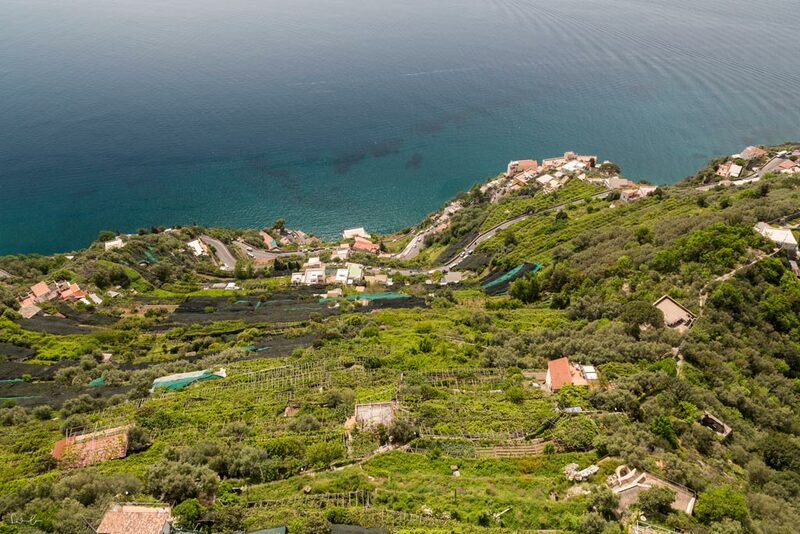 My tip: If you feel the same you might want to discover Praiano, the village before you reach Positano. It is smaller and a great location for sunsets. 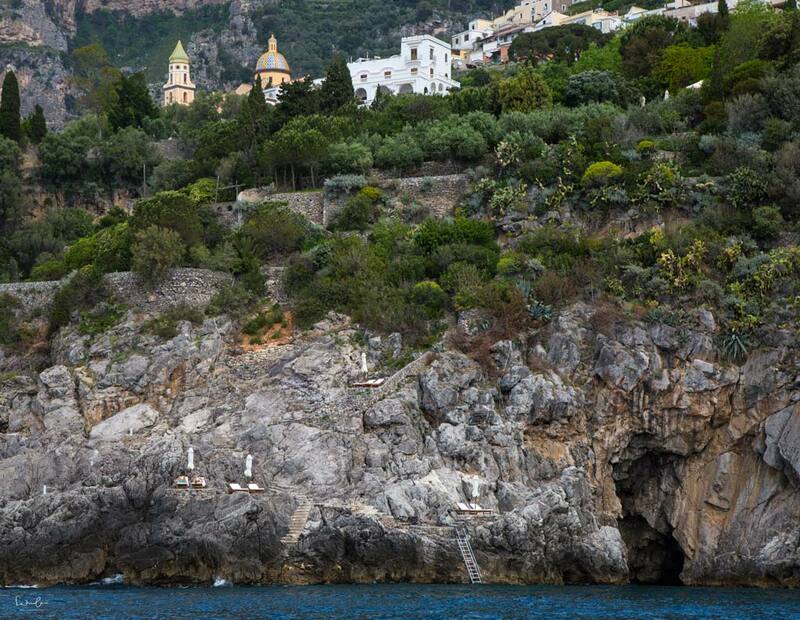 After the exhausting Positano experience, it seemed perfect to me to explore the coast by boat. Does this sound like your kind of fun? Then take a water taxi from Conca dei Marini to Amalfi and rent a boat. It is really easy in Italy, just deposit your ID and after a short instruction you can act like the boat is yours and cruise along the coast á la Bradley and Irina. It is an awesome thing to do. The villages look even more photogenic from that angle and you discover lots of treasures. My highlight was two dolphin families swimming and playing next to me. Need another insider tip for an empty beach? It’s unbelievable but there’s a hotel next to the Conca dei Marini beach with a private beach. And because the hotel is closed for renovation for an indefinite time and the beach is not properly accessible from the land, it’s deserted. From Conca dei Marini beach you can either swim or take the kayak which seems to be the better option in order to take a towel and sun lotion with you. I spent a wonderful couple of hours there, enjoyed a swim and the view on Sophia Loren’s former property. What a great way to end my 4 days Amalfi coast experience. 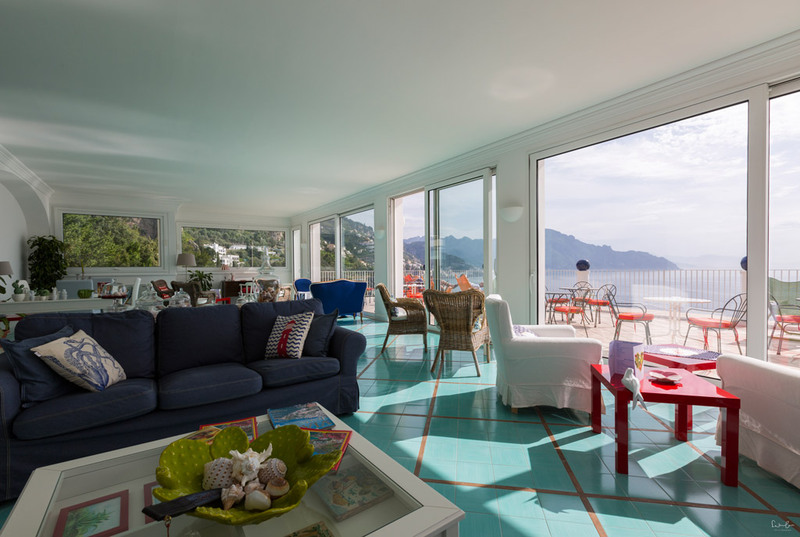 Hotel Le Terrazze in Conca dei Marini* is a beautiful, stylish hotel with a terrace and a breathtaking view of the coast. The rooms are quite big and kept in white, with balcony or terrace. I could see the sea from the bed – love it! Marcello and his team are wonderful hosts offering a superb breakfast with a view. It’s only a short walk to the beach where you can choose to eat in three different restaurants. The absolute highlight for me was the possibility to hire a kayak and spend time on deserted beaches. The driving time from the airport of Naples is approximately 1 1/2 hours. If you decide to take a rental car, which is still the easiest way of getting around, take the smallest car you can get and make sure you have a proper insurance. Be aware that the roads are very narrow, parking is really a challenge and there’s just too much traffic on this short coastal road. The best and most comfortable way, but also the most expensive way, is to take a shuttle to your destination and then use water taxis. You can also hire a scooter but you should be familiar and feel comfortable with it. One more thing. On the way from the coast to Naples on the SP1 you will come by Alfredo. He is offering the best lemon sorbet ever. Watch out for a small lemon stand on the side of the road. And if you want to enjoy your last Pasta Sorrentina before you head to the airport, stop at Farmhouse La Grotta at the end of the winding road. If you plan a trip to Italy’s hot spot, you should not miss my best photo spots on the Amalfi coast. Do you have more time available? Check out these amazing Italy travel itineraries. Disclaimer: This article contains affiliate links* which means I will earn a small commission if you purchase/book through my links. This is without extra costs for you. Thank you for supporting me. Excellent tips! I haven’t been there yet but when I go, I’ll be sure to remember all this, especially to avoid Positano. By the sound of it I’d hate it. But how is it possible they simple rent boats without any proof of skills? 😮 I bet accidents are common. This post is beautiful, I could look at the pictures all day. 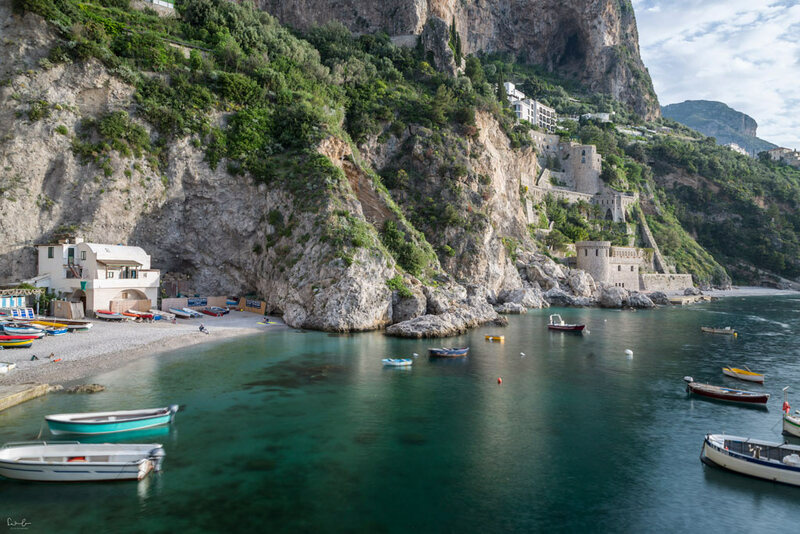 I have never been to the Amalfi coast, but I would love to go there. Ravello looks like a beautiful place! I really like all your tips in this article! 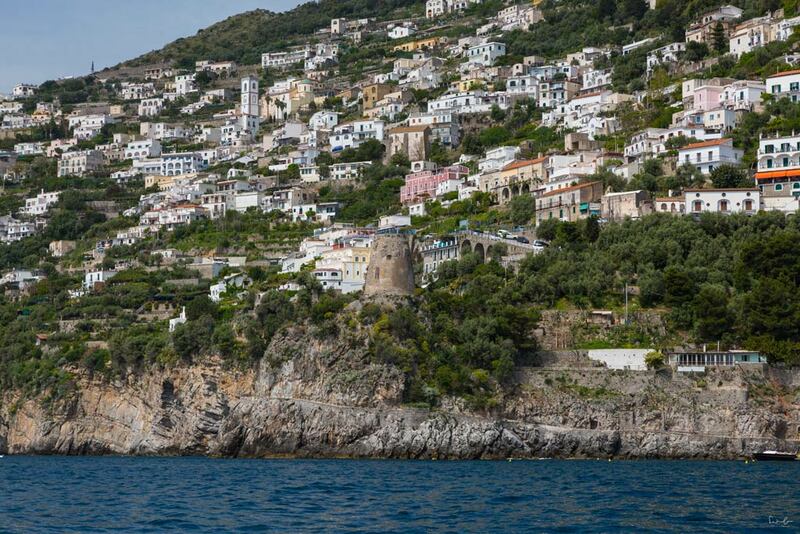 I am heading to Positano this July and love the idea of seeing it from the sea on a boat. I’m going to explore this option further. Thanks so much. wouldn’t we all love a piece of Bradley…but Amalfi looks like a fabulous destination without him in tow 😉 Thank you for sharing this post! You saw dolphins!! 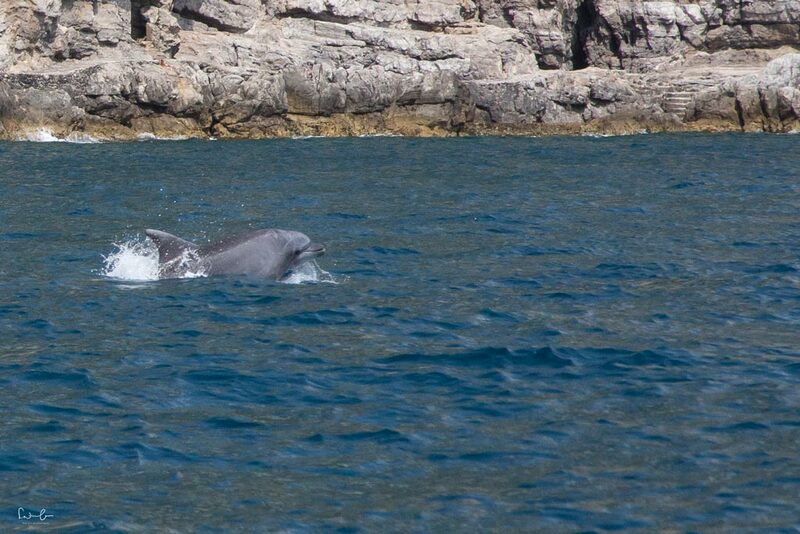 I have never seen dolphins in the wild. 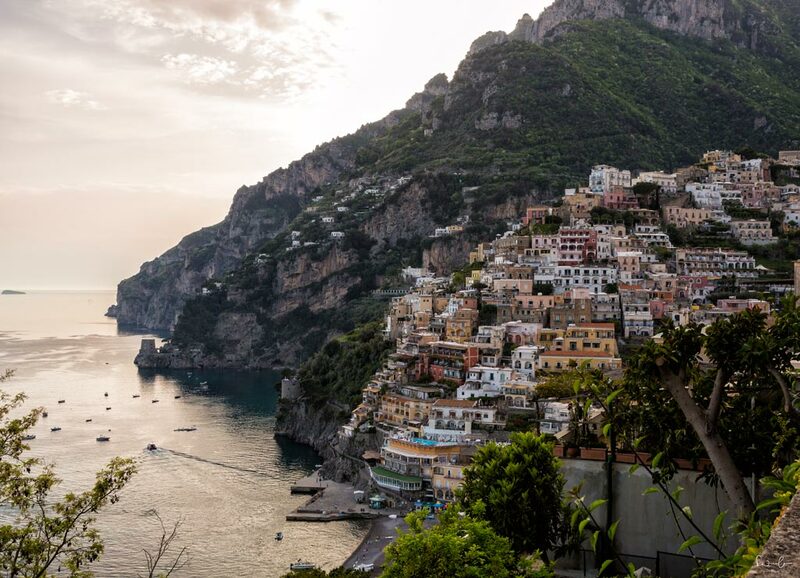 The Amalfi coast is very high on my bucket list. Your pictures are gorgeous! You are making me want to go back to the Amalfi Coast! 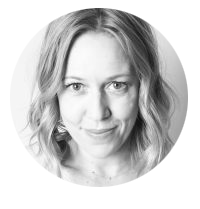 You’re photos are stunning and the tips here are so informative! 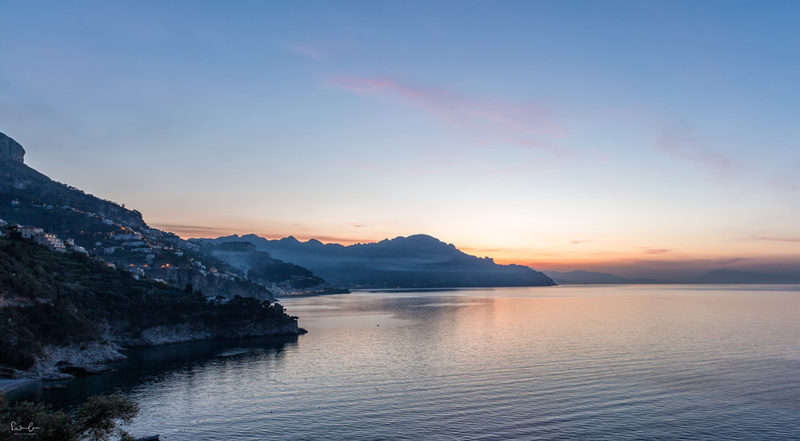 Ravello in the morning does sound like a great Idea! Thank you so much, Dana. Is there a possibility of staying at one place for seeing all these places ? I am planning to Amalfi and your tips seems wonderful. Thanks for the great post. And I am also planning to use public transport. This is definitely on my bucket list!! Thank you so much for sharing all of this. Really hoping I can go soon! Thank you for your visit to my site and for your comment.